Lock and key is an access control security method that is still in wide use across a variety of industries. The convenience and simplicity of lock and key security is hard to beat. Lock and key technology has continued to move forward to improve resistance to security concerns such as lock picking and key bumping. Many industries continue to make use of lock and key as their primary access control security method. While lock and key does enjoy many advantages as a security system, there are a number of faults in traditional lock and key systems that aren’t easily rectified. Keys can be lost or misplaced, or loaned to other personnel and lost in the shuffle. It’s difficult for management to know who has which keys, how long they’ve had them, or when they are due to be returned. This is where a key management system comes in. A key management system is a modular design that is used to effectively keep track of physical keys at all times. A storage unit is set up with different modules to hold different keys. All of the information relevant to the keys is tracked by the system, which the user can interface with via a touchscreen, for example. Once the user confirms his or her identity to the system by means of a card reader, for example (which can be integrated with pre-existing card reading systems in the facility), he or she can view the status of every key. This includes who currently has the key, how long they’ve had it, when they’re due to return the key, and what areas of the building they have access to. 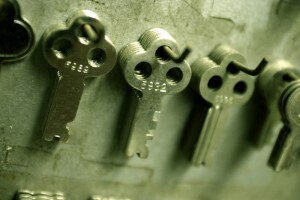 Key management systems can also be customized to take a proactive approach to key security. The system can send administrators an alert when a key has not been returned on time, for example. Alarms can be installed to alert when an attempt at brute force is used to open the key module, for example. A key management system is an ideal marriage of tried and true security methods with new innovative methods, and offers a comprehensive and efficient way to monitor key usage at all times from one central location. This entry was posted on Thursday, November 13th, 2014 at 2:21 pm. Both comments and pings are currently closed.